Here is my question for today. We know that there is a Mitzvah on everyone of us (unless we are destitute so to speak) to donate money for Chittim before Pesach for the needy people of our city. As we know, the price of Shmura Matza is going up each year. I’ve even heard that “Brisker” Matzos cost $50 a pound. This is perhaps a new definition of Lechem Oni, bread which makes one poor. Now, technically, it’s the first night (and sometimes second) that Minhag Yisrael is to have Matza Shmura. Standard Kosher Matza suffices for the rest of Pesach, although there is no command to actually eat Matza if you don’t want to after that. What does a Maos Chittin fund do if the recipient specifies that they will not eat anything but Matza Shmura for the entire Pesach, and they are accustomed to Matza X for this purpose. Do they have to provide this to the recipient as per Dinei Tzedaka, or do we say this is different? It could be argued that if the recipient normally eats Matza Shmura and doesn’t on the later days of Pesach, then they might have to have Hatoras Nedorim (annul a vow) because after having a Chazaka of a Chumrah/practice, it becomes like a vow/Neder. Would it be acceptable halachically to use machine shmura for those in need for Chol Hamoed and the last days? After all, you don’t need Lishmo then, do you? Or do you say that the implicit Neder applies to the Cheftza of a particular style of Matzo? What if a fund could feed more people this way or provide more to a particular family this way? Of course, one could annul their implicit vow, but we’d not want a person to do so unless there was no choice. You’re deliberately setting up a false contrast. Everyone knows that there’s no need for lishmoh except at the seder. Those who only eat hand matzos all Pesach are obviously not doing so becasue of lishmoh. They are doing so for kashrus reasons, as you well know. The view that machine matzos are more mehudar than hand ones exists, but it is very much a minority one. Presenting it as if it’s universally accepted and uncontroversial is not right. The reason why all chassidim eat only hand matzos, and regard machine matzos almost like chometz, is because the Divrei Chayim forbade them, and he refused to give his reason, precisely because he did not want anyone to come along later and permit them. You say “Chodosh Ossur min HaTorah”. It applies only for the first day of Chag Hamatzot. On the rest of the Passover days, after we started counting the Omer, it is Mutar=allowed. I can and am quoting the Divrei Chayim, because his issur — and that is exactly what it was — is the reason people insist on hand-made matzos. What has “today” got to do with it? Or “scientific observation”? You don’t know his reasons, so no amount of scientific observation wll help you, because you don’t know what to observe. Until you know why he forbade it, you can’t say the reason no longer applies. And when he said that his refusal to give his reasons was precisely so that nobody will ever be able to override the issur, that means that he didn’t care what changes happened, the issur as to remain forever, or until someone greater than him came along. Who is that? False. Who claims lishmoh is relevant after the seder? The prushim are irrelevant. So is Brisk. They are not the ones eating hand matzos. Your bringing them up is a red herring — a dishonest debating tactic. The people eating hand matzos are doing so because of the Divrei Chayim, and therefore they hold that machine matzos are forbidden. This is not a hiddur, they are doing it because they hold that it is base halacha. A mo’os chitin that supplies machine matzos to someone who follows the DC’s issur is exactly like one that supplies rice to someone who holds that it is forbidden, or one that supplies grape juice to one who holds that it does not have the status of yayin. We don’t eat herring only because of a chashash that’s not shayach anymore. I have no issue with herring with a hechsher red or otherwise. The Divrei Chaim is completely irrelevant on this topic. Did he ever see the matzoh factories of today? He was also a Rebbe so don’t even pretend the Lishmo didn’t influence him. As Meme pointed out, go to the Chacham in your time. Things are changing and one needs a current ruling. Post of February 5, 2014. He (Divre Chayim Rabbi Chayim Halbershtam) also ruled that the Arba Kanfot should be put on Hand Woven cloth and not Machine Woven. How many people do we know that have a Tzizit on cloth that is hand woven? Source, please. I have never heard that he ruled so, and can’t think of any possible grounds on which he could have done so. I know that he did forbid machine-spun tzitzis, and famously said that these are fit only to be put on machine matzos. Milhouse, you are right. Rabbi Halbershtam must have had a healthy humor to say that. Don’t you think that we, as Clal Yisroel, should accept opinions of Poskim nearer our time? because things change. If we take for example the machine-spun Tzitzit you mention, the Chazon Ish, who functioned generations after Rabbi Halbershtam, is Matir חזון איש (או”ח ו, י) . It seems that he saw the development in technology and adapted it to the contents of the house (of the Maharal) to bring it up to date. Why do we eat handmade Matzos? I have been told (probably as a joke): it says עוגות מצות and Ugos = cakes are usually round. Milhouse is a Chosid as was the Tzanzer a Rebbe. There is a certain freezing effect in Halocho that occurs if it emanates from a chassidishe a rebbe who is also a huge Posek. Ironically in Lubavitch the biggest Rebbes who were Poskim were the 1st, the Shulchan Aruch HoRav and the Tzemach Tzedek. But the Tzemach Tzedek wasn’t afraid to pasken against his Zeyda on occasion! Just a few examples of how the Halacha develops. רבי יוסף אלבו (ספר העיקרים ג, כג) אומר “שאי אפשר שתהיה תורת ה’ יתברך שלימה באופן שתספיק בכל הזמנים, לפי שהפרטים מתחדשים תמיד… הם רבים מאוד משיכללם ספר, על כן נתנו למשה בסיני, על-פה, דרכים כוללים… כדי שעל-ידם יוציאו החכמים שבכל דור ודור הפרטים המתחדשים”. נקח לדוגמה מפרשת משפטים את עניין “עין תחת עין” וגם נאמר: “כאשר יתן מום באדם כן ינתן בו” (ויקרא כד, כא) מה אומרים רבותינו – לא עין ממש אלא ממון. בחובל אומרת התורה: “וכי יכה איש את רעהו באבן או באגרוף… רק שבתו יתן ורפא ירפא” (שמות כא, יט). אבל מה קובע בעניין זה התלמוד? “החובל בחבירו – חייב עליו משום חמשה דברים: בנזק, בצער, בריפוי, בשבת, ובבושת” (בבא קמא פג ע”ב). תשלום של חמשת הדברים נקבע כי חכמי התלמוד ראו בהם, באותה תקופה, פיצוי הוגן, והפיצוי שקבעה התורה כפיצוי חסר במונחי זמנם. גם השולחן ערוך אומר (בהלכות חובל בחבירו תכ,לח) “ויש לבית דין בכל מקום ובכל זמן לגדור כפי מה שיראה” לא שני הדברים שבתורה ולא חמשת הדברים שבתלמוד, אלא “כפי מה שיראה”. I understand R’Yosef Albo (and love his work) but he was a philosopher not writing Halacha. I much prefer the Rav’s explanation, which is that it would be impossible for the Torah to write anything other than Ayin Tachas Ayin. Doing so, would attempt to put a monetary value on something which is so personal and which changes from case to case. The Rav just saw things so clearly, which is why I love his Torah. As a Chabadnik I understand your liking of the Shulchan Aruch of the Rav. Rabbi Yosef Elbo wrote just the quotation in the first paragraph, not the “Ayin tachat Ayin”. We need Philosophy as well as Halacha. Wasn’t the Rambam also a Philosopher? I brought the “Ayin tachat Ayin” as an example that our sages revised it to Mamon. The second quotation of Chovel. Here we see two revisions. 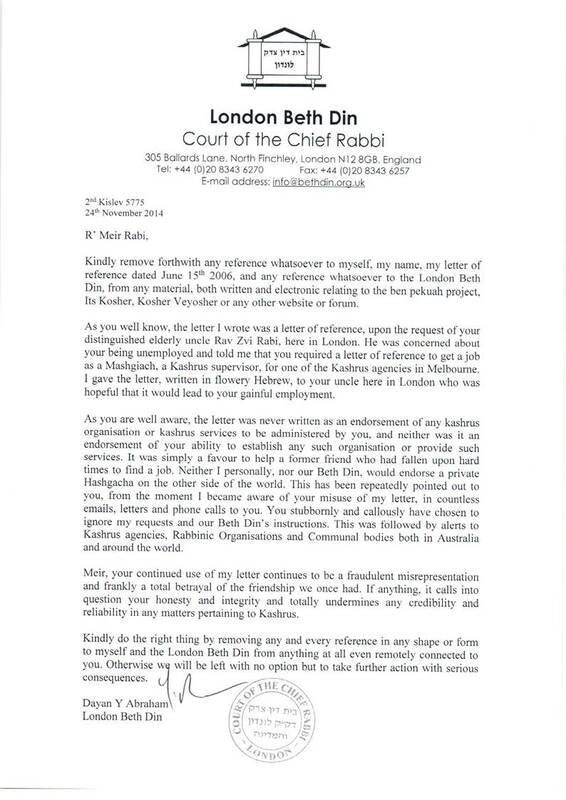 The Rav I meant, was Rav Soloveitchik and whilst my mechutonim would be thrilled that you called me a Chabadnik, I’m not! I think you know the answer to the first question. As we know once the dough is made it has to be in constant flux or motion or processing. the halacha maintains that if it rests for a moment it can become chometz – heaven forfend! Now with machine-made the process from go to oven never ceases. However, with the best will in the world this is virtually impossible with the hand-made variety. The lapses or moments of being in a state of idleness are small but nevertheless do exist. What are we to make of them? Tradition, nostalgia and Lishmo all account for why we continue to do it this way but we live in the 21st century and mechanical/automated processing is superior to what man can do. STAM will never be replaced by automatically produced products but that is because the have to be ‘Written by hand’ Nowhere does it say matzah has to be made by-hand. I’ll leave that for you to ponder over. i think if the tzedakah fund has limited abilities to meet everyone’s need, then you could apply rambam’s hilchot arachin v’charamin 8:13 regarding not impoverishing oneself for the sake of others. the tzedakah fund is like that person – if it goes into debt and can’t help others (because it had to spend too much on shmura matzah) then it defeats its purpose. any rav worth his halachic salt will help the person in need figure out what to do for seder night. compromising one’s material or halachic standards so as to not benefit from Tzedakah is rather a personal choice – not one to be dictated by the community. b) such a stipulation will constitute the modern-day equivalence of the infamous “let them eat cake”…. Your point, though, can be granted from a different perspective: the original חיוב mandates the provision of wheat – not Matza. One can therefore reasonably argue that the extra chumros (and costs) associated with the baking fall in the court of the recipient. However, if the objective here is to provide the poor with means of buying Matza, then, perhaps, the community is obligated to provide each one with his standard, be it Manischewitz Matza or hand-made iPhone-free Matza` . יש להדגיש, כי יש פוסקים אשר נתנו למנהג זה תוקף של הלכה. ודבר זה הוא חיוב על כל אדם (ועי’ מ”ב שם ס”ק ה’), ואינו חומרא או חסידות בלבד, וכופין את הסרבנים. ואין אדם יכול לפטור עצמו במה שנתן לעניי עיר אחרת. “ואין עצה ותחבולה להשתמט ממגבית זו. פלוני זה עשיר וידו קמוצה וטוען שאין לו, אומרים לו: אם אין לך – היה מן המקבלים, או תן או קח, והוא בוש ונותן; פלוני זה עני ובוש לקבל – מתחכמים לו ונותנים לו דרך הלוואה או שולחים לו בדרך שאינו יודע מי שלח” (“ספר התודעה”). וכל עניי העיר זכאים לקבל ‘קִמחא דפסחא’ ממגבית עיר זו. וגבאי הצדקה ישפטו במאזני צדק ויתנו לכל עני לפי מצבו ומספר נפשות ביתו. עני המבקש לאכול מצות שמורות ומהודרות והן יקרות יותר ממצות פשוטות, אפשר (“פתחי תשובה” סי’ זה) שאין חייבים לתת לו, אבל אם הוא בן תורה או שמנהגו כן תמיד מחויבים לתת לו מצות שמורות ומהודרות כפי הרגלו”. (ע”פ “הלכות חגים” פ”ב, ה”כ – הכ”ג. וע”פ “פסקי תשובות” ח”ב תכ”ט, ב’). Note that there is a big difference between shmura matza and hand matzah. Nobody holds that shmura matza is a chiyuv; everyone holds that it’s a hiddur. In Europe most people would eat non-shmurah hand matzos for most of Pesach, and even in Lubavitch everyone would do so on Achron shel Pesach. But hand made non-shmura matza no longer exists, because it makes no economic sense to produce it. The difference in price would be minimal.